Watch the echidna knuckle down in this retro stage. Fans of salmon-coloured monotremes will be pleased with the latest trailer for Sonic Mania, as it shows everyone's favourite Sonic sidekick (who isn't Tails) tackling another remixed zone from the original Mega Drive games. We were given a super-brief glimpse at the Flying Battery Zone back in March, but here's a longer look, with the slower-paced Knuckles taking centre stage. 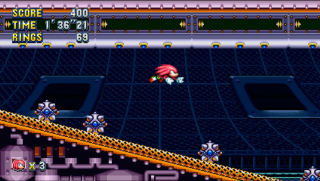 I've not played the original games in years, so I'd forgotten how differently Knuckles plays compared to Sonic. He can climb walls, for one thing, and glide through the air for another. I'm not sure how this new version of Flying Battery Zone differs from the original, but I'm looking forward to careering through it all the same. Sonic Mania was delayed into the Summer a little while back, and unfortunately there's still no firmer date than that yet. Console yourself with the thought that there is another, bigger-budget Sonic game coming out this year too: Sonic Forces, which mixes 2D and 3D levels and that, admittedly, looks a bit naff compared to the nostalgia-tickling Mania.